I picked up the first Unwritten trade a little while back. I had it tagged in my Amazon shopping cart, but I honestly can't remember why I put it there. Did I just hear good things about it? Did I come across a great interview with one of the creators? Did somebody recommend it? I don't know. Regardless, by the time I actually ordered and read it, I couldn't remember anything about what I might've heard about it. Not even a basic plot outline. But I read it and enjoyed it a fair amount, so I ordered the second trade, which I just read this afternoon. I still think it's done well and I'm mostly enjoying it, but part of it isn't sitting well with me any more. The basic plot revolves around Tom Taylor, the son of a famous author who disappeared several years ago. The books which made him famous are pretty analogous to the Harry Potter series (both in terms of genre and theme) and the main character is named Tommy Taylor. So Tom Taylor goes around to conventions doing talks and signing autographs, and generally being miserable because his father made such a big name for him that he's not able to make one for himself. Then weird stuff starts happening and things go to hell pretty quickly. One of the main ideas of the series, from what I've read thus far, is that books have power. The best books, and the most widely read ones, start to take a literal form and help to shape the world around us. One of the questions in the book is whether Tom Taylor is, in fact, his father's biological son or merely a literary construct given real form. The idea isn't wholly original, of course. Variations on the theme have been used in comics before; Tales to Astonish #20 had a more literal approach where things written out on a typewriter actually happened and John Byrne's She-Hulk was very conscious of the fact that she was appearing in a comic book being written and drawn by Byrne. But, despite that, there's a lot to be said for the particulars of the execution here. The story unfolds well and Mike Carey and Peter Gross do an excellent job emulating the styles of various other books. But something about it is bugging me. Maybe the continued references/allusions to Harry Potter? The books aren't called out by name, but the similarities are too close and persistent for coincidence. I mean, I get why Carey is using the analogy -- he's trying to clearly show just how big a global phenomenon these books are. Imagine if J.K. Rowling had nephew named Harold Potter? That guy would never hear the end of it, right? So I get what Carey is trying to do. And continuing that beyond the initial chapters? Sure, makes good sense within the context of the story. But I really get tired of it. Not because it's repetitive or distracting or anything, but because I really don't like the Harry Potter books/movies. I'm sorry, but I just think they're exceedingly average, pedestrian novels and the movies were just plain bad -- visual highlight reels from the books with no coherent story. And you know, that's fine that there are mediocre books out there and bad movies, but I'm well past annoyed by the decade-plus of constant media hype about it. I am glad the books have gotten so many kids to read -- I was just talking with a friend online yesterday about how reading trash is preferable to reading nothing at all. (For clarity's sake, at the time, I was talking about the worst of harlequin romance novels. I don't think Rowling's work is trash; it's just relatively banal.) But why so many people have gotten so excited about these stories for so long, I just don't understand. I can at least understand where, say, Twilight's or Avatar's popularity comes from, even though I don't care for either personally; for the life of me, I can't see why so many people have gravitated towards Harry Potter though. Which is unfortunate. I like the ideas and execution of The Unexpected but my annoyance with the Potter analogies, I guess, just runs deep enough for me to be bothered by the book despite it's good qualities. I think Harry Potter is popular for the same reasons that Naruto and Pokemon are(were) extremely popular. It taps into a child's inherent desire to leave home and seek adventure; the idea of being away from your parents and making a name for yourself. That's just what I gather from it, anyway. That is unfortunate, Sean. I think that Unwritten started with the premise of "what if Harry Potter was a real person dealing with its celebrity" but was quickly highjacked into those larger themes that you talk about, which I think would be right up your alley. In that light, the authors are actually *critical* of the Potter books, just as much as you are, and even moreso critical about Taylor fans. All of the Potter trappings are exactly that- trappings- that quickly become mere set up for the larger metacommentary going on. 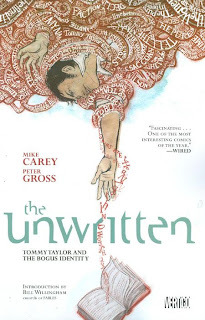 I've found Unwritten to be a complex, insightful, and downright literary adventure serial that pushes our expectations. I bought the issue about Kipling and it was pretty good, though it hasn't motivated me to go buy any more.